A generous drizzle of Thai peanut sauce makes chicken stir fry taste so amazing that I’ll be making extra just so I have a chance to enjoy these irresistible wraps! When it comes to making stir fries or ordering take out, I usually prefer the food piping hot, straight from the wok. Nevertheless, we usually wind up with leftover stir fry, which is less appealing the next day. Until you add a tangy peanut sauce. Then it’s a toss up as to whether to eat more of it in round one or two! 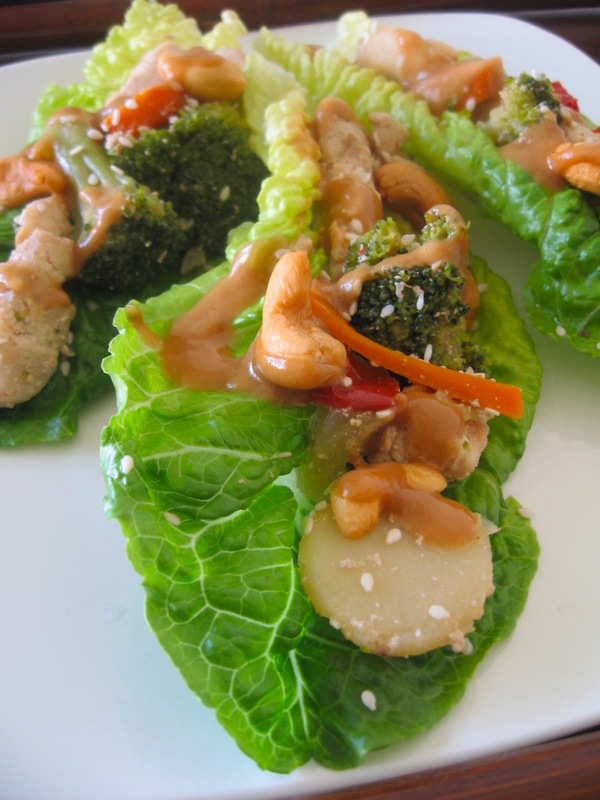 Wrapping up the peanut-y goodness in Romaine leaves is simple, unprocessed, and truly delicious! While I find low carb tortillas and wraps intriguing, the hollow taste often disappoints. And these days I simply lack the time and motivation to roll out homemade tortillas, as delicious as they are. I’ll let nature do the work for me. Not only are Romaine leaves low in calories, they let the sweet and savory flavors of the filling shine through. In our current rhythm of life, weekends are when we eat up leftovers that have accumulated during the week. But for some folks, weekends are when the cooking happens, and weekdays feature leftovers. Which camp do you fall into? Either way, peanut sauce livens up your leftovers to make them worth craving. * Substitute tofu or chickpeas for a vegetarian option. Gently warm stir fry in a wok over medium heat or in the microwave. It should be warm but not too hot or it will wilt the lettuce. Use a spoon or chopsticks to fill Romaine leaves with the warm stir fry. Sprinkle the filled leaves with cashews and sesame seeds if desired. 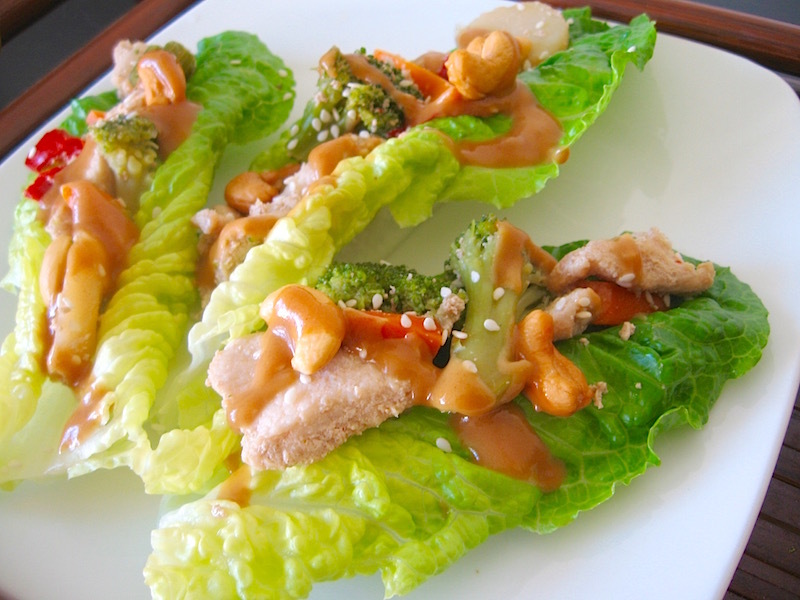 Drizzle with peanut sauce. Serve slightly warm. To enjoy the wraps in a packed lunch, place some peanut sauce in a separate small container and wait to drizzle just before eating.